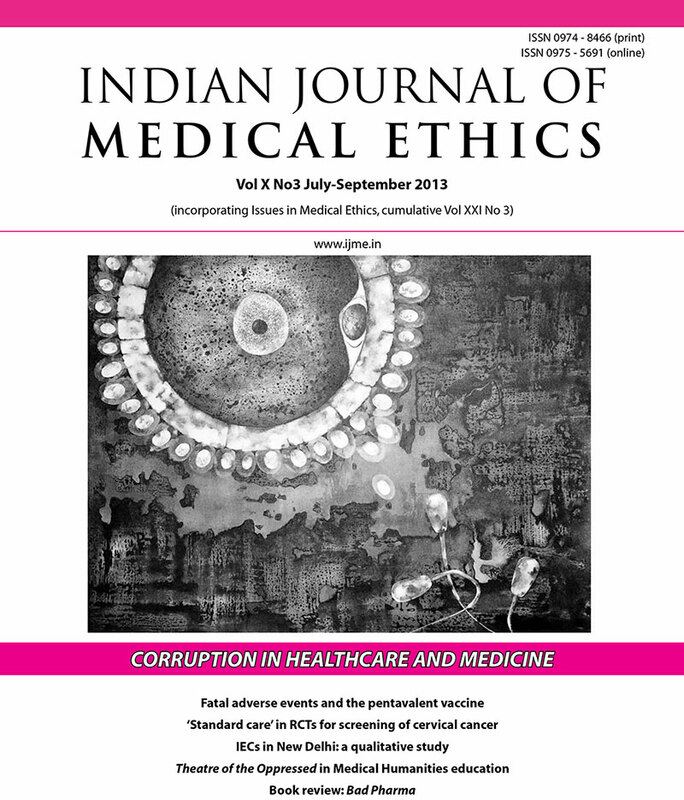 This July- September issue of IJME deals with the unglamorous theme of corruption in healthcare and medicine. ‘Unglamorous’ because it is stale and sordid and, most Indians feel, impossible to root out. Yet this enemy cannot be evaded, since it is a major factor in matters of life and death. Our authors present a holistic analysis of the beast; of its presence in the West through the instance of the dubious activities of pharmaceutical and device manufacturing companies; and, in this part of the world, of the decay in a venerable Indian institution. And since the beast may very well make its home in ourselves, the final paper deals with personal efforts to combat it. We owe sincere thanks to Subrata Chattopadhyay, the moving spirit behind this theme-based segment. The issue offers a lot more, with editorials on the link between the deaths (euphemistically called ‘serious adverse events’) of infants and the pentavalent vaccine; and the ethics of ‘standard care’, which is no care, for participants in cervical cancer trials. Original articles deal with the functioning of IECs, the awareness of medical ethics among medical students, and the all important national immunisation policy. A respected scholar shares her memories of Dr Edmund Pellegrino, who dedicated his 90-plus years to bioethics. Two commentators discuss the need to balance justice for participants in clinical trials with the urgent need for adequately-tested life saving drugs. A group of enthusiasts share their experiences of teaching medical humanities using the Theatre of the Oppressed. All this, plus our regular reports, book and film reviews, and news round-up in the field. Corruption in healthcare and medicine: Why should physicians and bioethicists care and what should they do? Are tomorrow’s doctors aware of the code of medical ethics?